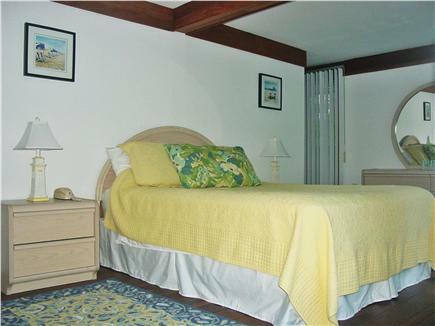 Cape Cod - Large Secluded Home at New Seabury. 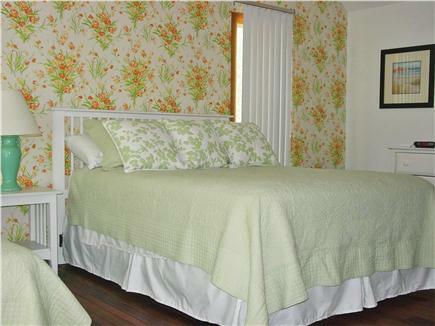 Our ''Green'' Bedroom contains both a queen and a twin bed. 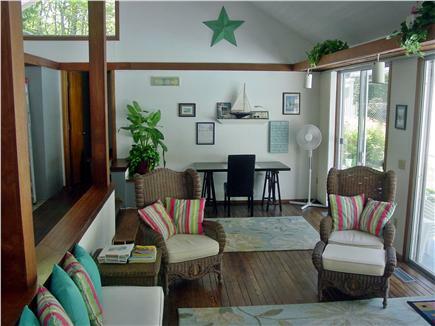 Our spacious L-shaped ranch style home is located in desirable Highwood Village of New Seabury. 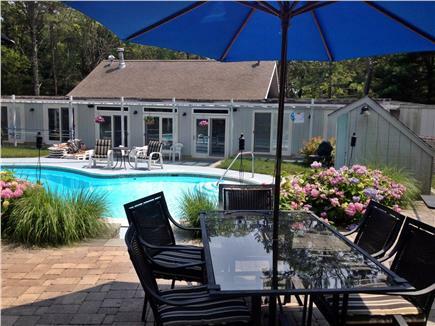 The house provides ample space for large / extended families to enjoy all that Cape Cod has to offer. From the bright and airy interior, 9 sets of glass sliding doors open onto the patio & pool area. 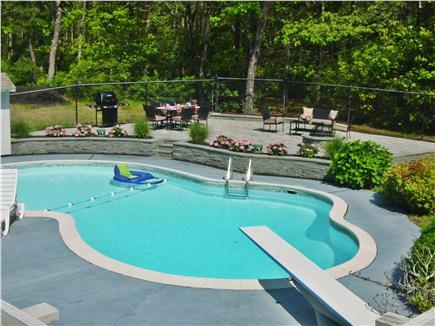 An in-ground kidney shaped pool, includes a diving board for all to enjoy. 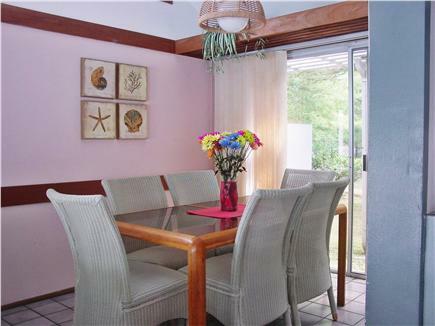 From the back patio, family members can watch divers perform as they sit comfortably around the glass table, under the shade of an umbrella, enjoying sun filled days. The assortment of outdoor furniture, umbrellas, fire pit and gas grill maximize the use of this sunny ''outdoor room''. For those returning from the beach, an outdoor shower awaits. On the front side of the house, sliding doors lead to a private fence-enclosed patio, complete with a table and chairs, providing a quiet oasis to read the morning paper, checking social media or to simply enjoy a cup of coffee or private conversation. 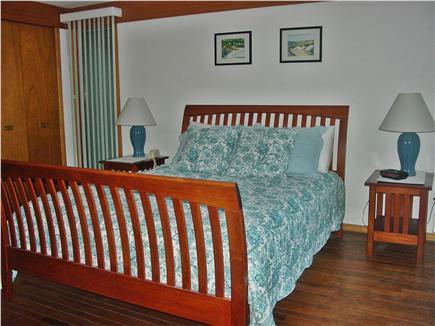 Back inside the house, the floor plan includes 4 bedrooms, each with a comfortable queen size bed. A private bath accompanies each bedroom. Beneath the cathedral ceiling of the Great Room, are the galley kitchen with quartz counters, dining area and sunken living room. The house has a fully equipped kitchen. Appliances include: microwave, dishwasher, blender, 2 coffee makers (both a Keurig & traditional) and fridge with ice maker. A separate entertainment room contains wifi, cable TV, stereo and DVD/VCR. Also stored here are a large assortment of games and puzzles for family fun, on the occasional rainy day. 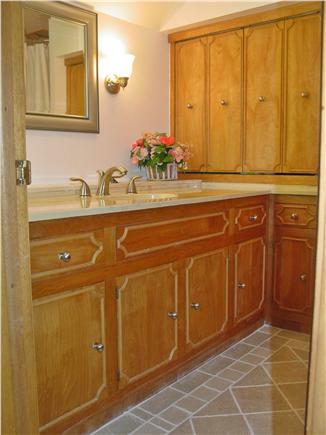 A full size laundry room completes the floor plan. Wireless internet exists throughout the house and yard. Except for beach towels, linens are also supplied leaving extra room in your car or suitcase. 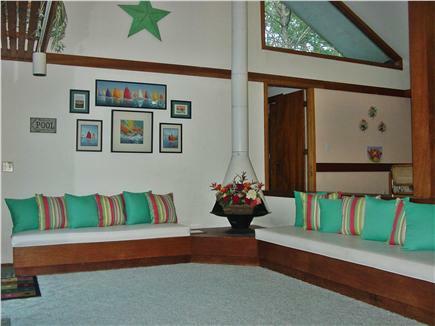 Except for the two step down sunken living room, the entire house is a one level ranch style home. Thanks, Peggie, for the kind words.